Kalaipuli Thanu is funding two important films right now, Kabali with Superstar Rajinikanth and Theri with Ilayathalapathy Vijay. While Theri is completed, Kabali will be wrapped up soon. On the subject of the release dates of these films, April is said to be the release month for Theri. 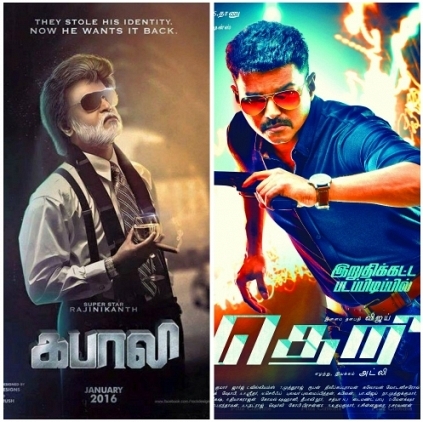 Earlier on, although Kabali was touted to release in April, now that Theri is completed, it is likely to hit first. Since state assembly elections are likely to happen in May 2016, the release of Kabali may happen after the elections. We would keep you posted. Rajinikanth's Kabali And 2.0 Shooting Updates! People looking for online information on Kabali, Kalaipuli thanu, Rajinikanth, Release, Theri will find this news story useful.